I had dinner at Place Gustave Toudouze last evening and since I was a little early I spent some time taking photos in the neighborhood. 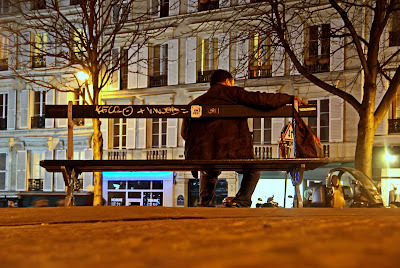 I saw this guy on a bench with the typical Parisian facades in the background and I was sure this would make an interesting photo. Of course I used the "now famous" Tenin's perspective ;-) and worked a little bit on the color, to remove the "orange spray" due to the street lamps, but in the end, yes, I kinda like it. By the way, did you know there are 8 481 benches in Paris?! now that would be an interesting goal...to sit and take a photograph at each of those benches. this really does work well, eric. this IS a lovely perspective! & I like what you did with the color as well. I love the colours and the light in this beautiful photo. Many interesting elements in this photo: the golden light, the blue light, the man with his arm extended protecting his bag, the shape of the bench legs, the enclosed moto parked on front of the bench. It all comes together for a wonderful photo! Merci, Eric. And I am wishing that I were sitting on one of them. Interesting light, like a film set. Didn't know this place, so Googled the street view - Same guy sitting there (only kidding), and the cost of a Shampoo, Cut and Blow Dry has of course, gone up. I think Eric was at the No Stress Cafe. Maybe the place right next door. JUST A QUICKIE from Paris to say , LISTEN TO eRIC...he knows what he is talking about!!!!! RUN DON'T WALK TO voca PEOPLE, ESPECIallY you aLEXA! I enjoyed the shot as many others. I have been intending to write about this for over a month. On occasion, the photo of the day does not display. The text does. The following are those that I have missed, and based on the text I am missing some striking images which still do not display. Code Red!, Lady in Red, Yummy Cheese, Carnaval 2011, (all this week) as well as A Paris Institution, New Bike Lanes, Hello Lady!, Spring!, Crossing Lines, Thank you Charlie!, Fountain Stravinsky. Well that takes you back to February 1. You can see that is quite a bit, and I am disappointed because I can’t get my daily fix of Paris seen through the eyes of Eric. Wonder if anyone else is having this problem or just me. Stef: I have not had any problems either on my iPhone or on my lap-top. Have you tried a different browser like Firefox or Chrome?!? Or perhaps you have to adjust your settings to allow for certain types of images to display...or to clear your cache?